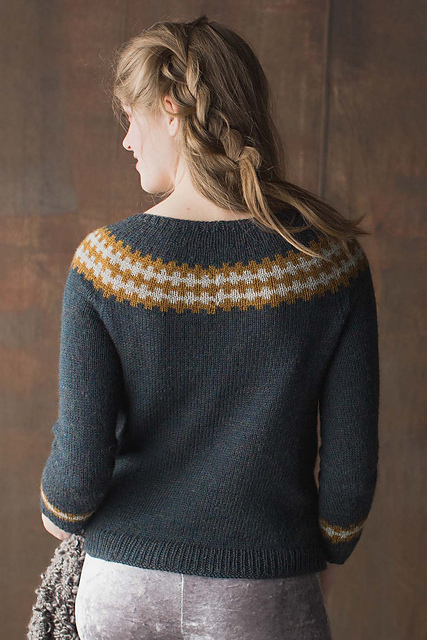 The design prompt was Modern Fair Isle, and it inspired me as I’d always wanted to create a traditional yoked sweater, but I’ve never been a huge fan of the traditional fair isle motifs. Something about my existing wardrobe just wouldn’t be too friendly to the multiple colors and stitch patterns. I prefer pared down colors, and more graphic prints so I sketched a yoke with a simple grey & black checked pattern. 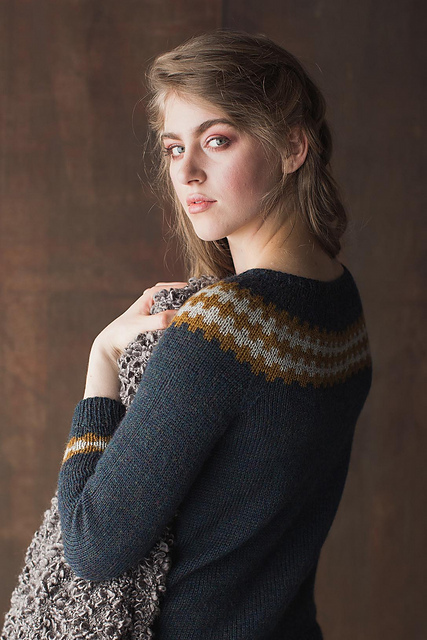 Worked in only 2 colors with a handful of “rest rows” this yoked sweater is a great beginners pattern for fair isle, but will keep more advanced knitters intrigued as well. 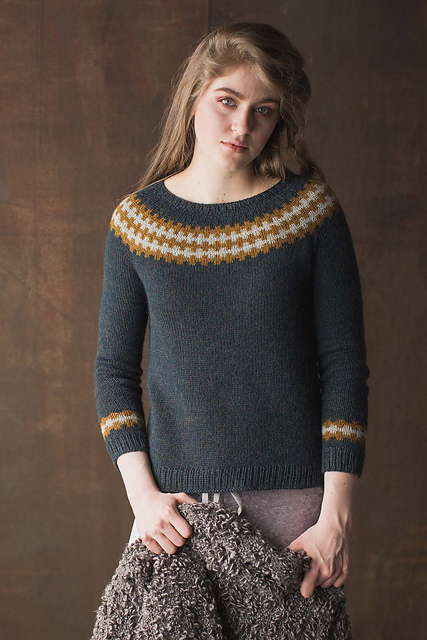 The Indigo Smoke Pullover is worked in the round from the bottom up with the sleeves and body worked first. The sleeves feature one repeat of the colorwork stitch pattern. After the completion of the lower body & sleeves, the three pieces are joined together before working the yoke. The yoke is shaped with raglan decreases for the first 1 ½” with the remainder using standard yoke shaping decreasing methods. The colorwork of the yoke is worked straight with additional decrease rounds worked after the yoke depth is achieved. The sleeves, neckband, and body hem are trimmed in a neat 1x1 ribbing. Once all pieces have been knit, the sweater is blocked and ends are woven in. This pullover will be your new fall & winter staple! It pairs perfectly under a smart coat, or as a statement on it’s own over a corduroy pencil skirt. Whether you’re headed to a holiday party or the coffee shop around the corner you can’t go wrong with this sweater!